Northern Wind Continues to Enjoy their Longevity and Leadership Position Within the Seafood Industry. 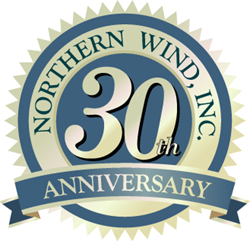 Northern Wind, an industry leader as a direct off-loader, processor and distributor of fresh and frozen scallops is proud to announce that the company is celebrating its 30th year in business. Since its founding in 1987 by Ken Melanson and Michael Fernandes, Northern Wind has established itself as one of America’s fastest growing seafood processing and distribution companies, providing its customers with a wide variety of premium scallops and seafood from across the globe. Northern Wind prides itself in providing their customers with the freshest seafood products that have been responsibly harvested using sustainable and environmentally friendly practices. With three decades of business relationships throughout New England and across the globe, Northern Wind is a top direct-off loader, processor and distributor of fresh and frozen scallops. Northern Wind’s seafood products include fresh and frozen scallops, Ahi tuna, North Atlantic lobster, monkfish, headfish, skate and value-added seafood offerings. Northern Wind’s 70,000 square foot state-of-the-art facility is certified by the U.S. Department of Commerce Seafood Inspection Program for packing of USDC Grade A fresh and frozen scallops. Northern Wind was the first scallop producer in the nation to receive Fair Trade™ Certification and during the 2017-18 fishing season purchased over 1 Million pounds of Fair Trade scallops. In addition, Northern Wind’s start-of-the-art processing facility is BRC and MSC certified. The company has also launched a new line of high quality premium scallops under the Five Star Premium Scallop brand name which was introduced at last year’s Seafood Expo North America in Boston, Ma. The company has also redesigned its Captain’s Call, Mariner’s Choice and Sea Spray scallop product lines to better portray Northern Wind’s leadership position in the seafood industry. “The first 30 years have been an incredible ride. We’ve been blessed to have employees who are dedicated to quality and providing excellent customer service. I can’t wait to see what the next 30 years bring,” stated Michael Fernandes, Founder & President of Northern Wind. Since the beginning, the Northern Wind team has always dedicated themselves to consistently supplying their customers with the highest quality seafood products and providing them with superior customer service and competitive prices. At Northern Wind, Our Greatest Catch Is Our Quality! Founded in 1987, and headquartered on the historic New Bedford, Massachusetts waterfront, Northern Wind is a leading direct off-loader, processor and distributor of fresh and frozen scallops. Northern Wind is a member of the American Scallop Association and provides its customers with the freshest seafood products that have been responsibly harvested using sustainable and environmentally friendly practices. Northern Wind’s state-of-the-art facility is certified by the U.S. Department of Commerce Seafood Inspection Program for packing of USDC Grade A Fresh and Frozen Scallops. Northern Wind is also the first in the nation scallop producer to have their complete supply chain Fair Trade Certified™, and its facility is also MSC certified. Northern Wind’s scallop brands include Five Star Premium, Captain’s Call, Mariner’s Choice, Sea Spray and Bon Cuisine. Northern Wind’s scallop brands are positioned for nationwide markets seeking seafood offerings from sustainable fisheries that include supermarkets, club stores, national restaurant/hotel chains, and wholesalers that seek to provide their consumers with a unique seafood experience. At Northern Wind, Our Greatest Catch Is Our Quality! For more information regarding Northern Wind contact Ken Melanson, Founder & Chairman at 508.997.0727 or send us an email at info@northernwind.com.